Dortmund, a town of about 600 000 inhabitants in the region of North Rhine-Westphalia in Germany, is the most important center of the Ruhr industrial area and European reference point for technological innovation. In Dortmund the collaboration between companies of Information Technology and the university TechnologieZentrum has meant that the city has become a hub of innovation in Europe. In Dortmund live together innovation and tradition, culture and entertainment, starting from the zeal for the football team Borussia Dortmund BVB 09: the Westfalenstadion is one of the most popular tourist attractions of the city, with seats for more than 80 000 fans and hosting a museum with cups and memories of the prestigious football club. A great attraction is the casino Hohensyburg, frequented every year by more than a million people: it is built on three floors, with all the typical games of the casinos in Las Vegas. From a cultural and architectural point of view, Dortmund is known as the 'City of the four churches': four sacred places, guarding important treasures: the church St. Petri with 30 sketches carved and gilded, the church of St. Marien with its beautiful altar, the church of St. Reinoldi with the belfry and the Propsteikirche, the only Catholic church, with Derick Baegert’s masterpieces by the altar. Other heart of the city's culture is the Konzerthaus Dortmund, a concert hall opened in 2002 with capacity of over 2500 people in two rooms. Do not miss the museums: the art museum 'am Ostwall' dedicated to the art of the twentieth and twenty-first century, the Museum of Natural Science, Museum für Naturkunde, over 2,000 square meters of exhibition space with the life-size reconstruction of two prehistoric dinosaurs and the museum of art and culture, Museum für Kunst und Kulturgeschichte in an Art Nouveau building with archaeological collections, paintings and sculptures, but also visual art, graphics and photography. Also the mine Zeche Zollern is worth a visit, evidence of ancient mining activities in the area and the Ruhr. Among the most important events of Dortmund, there are the Mayday, a techno music show famous throughout Europe; the Micro! Festival!, with music and theater groups that invade the streets and squares; the Extraschicht, the night of industrial culture, with events and shows distributed in fifty locations throughout the city. Shopping in Dortmund is on Westenhellweg and Ostenhellweg, in the historical centre, as well as on Hansastrasse, where there are the boutiques of the most famous designers, in the commercial center Propstei-Arkaden or along the avenues Kleppingstrasse and Brückstrasse, in a recently renovated area with shops and boutiques of young fashion and sport. At an economic level, of great importance in Dortmund is the Messe, the trade fair of the city, with an exhibition space with a dozen of large halls, service centers, and hotels by the major international chains. Here take place the most important European trade fairs dedicated to hunting and fishing (Jagd und Hund), modeling (Intermodellbau) and Inter-tabac, International Fair of Tobacco and smokers items. NH Dortmund awaits you in Dortmund, near the central station and well served by public transport. The city centre is within short distance and by subway and tram nearby you can reach all the main attractions. 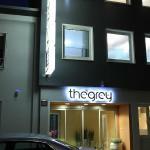 The Grey Hotel is located in the heart of Dortmund, just five minutes walk away from the railway station in the city. The famous shopping area of Westenhellweg is easily accessible on foot. Prodomo Hotel is located in Dortmund, near the railway station of Dortmund Korn-West, the historical city centre is reachable by a single subway stop. 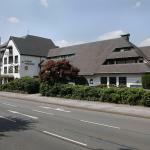 Westfallenhalle Hotel occupies an idyllic rose garden surrounded by tall trees. 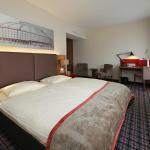 The hotel is centrally located near the fairgrounds Westfallenhalle and the area of Dortmund. The stadium is easily accessible. 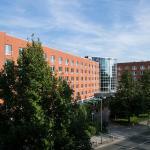 The Hilton Dortmund is located halfway between the Westfalenpark and the exhibition center Westfalenhalle. The nearest underground station allows you to easily reach both the centre and the city's major attractions. 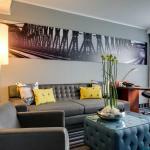 The Unique Hotel Dortmund is located in the old city, just ten minutes walk from the main railway station. The exhibition center Westfalen is easily accessible by car, as well as the Signal Iduna Park stadium. The Pullman Dortmund is located in the centre of Dormund, not far from the city and near the Exhibition Centre Westfalenhallen. The entrance of the motorway is just a few minutes away.